your home cleaning needs. Our team has earned a reputation as the premier residential cleaning service in Warrenton, VA and throughout Fauquier County since we opened our doors in 1992. 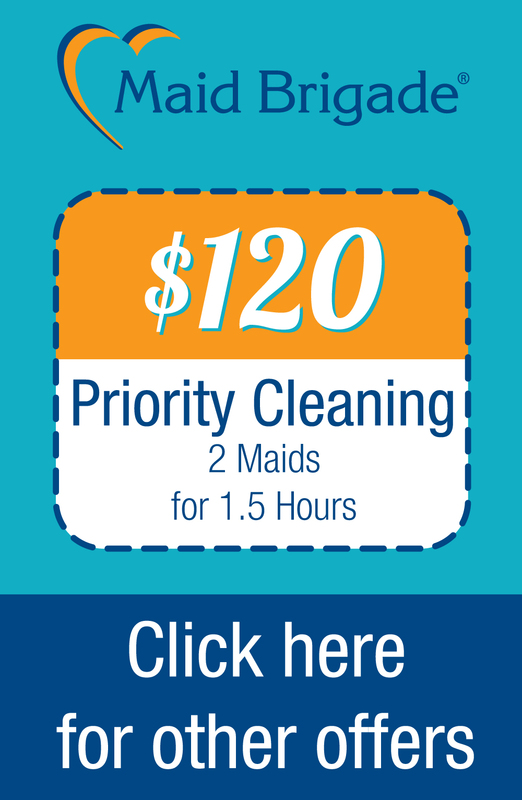 Our attention to detail and focus on the customer experience have earned us a reputation as the preferred maid service of your neighbors from The Plains and Marshall to Bealeton. It’s the goal of each employee to provide the best service, highest-quality cleanings, and healthiest environment for our local families. We invite you to give us a try. Call (703) 754-3635 or request a Complimentary Estimate by clicking the link. As a locally owned & operated, family-run business Gary and I take great pride in making sure our customers are happy. Over the past 25+ years, we’ve done our best to ensure that every home our maids clean is healthier and in better condition when they finish. It’s important to us that you feel a sense of comfort with me, Gary, our office staff, and the cleaners in your home. To ensure that we earn your trust in every possible way, let us share a little bit about our approach to this business. At Maid Brigade, we only employ the most qualified individuals. Each person undergoes a thorough interview process prior to being hired. They’re, also, bonded and insured (by us), so homeowners don’t have to worry in case of an accident. If you want to contact us directly, Gary and I are in the office, active, and knee-deep running the business on a daily basis. Call and one of us will answer the phone! High-Caliber Professionals: Our People Shine! As a member of the Maid Brigade family, it’s in our DNA to treat employees with care, compassion, and respect. We ensure everyone is paid a livable wage (exceeding minimum wage), empowered in their roles, given opportunities to grow & succeed, and has professional training. Our maids are employees of the company, so we invest time and resources in them as individuals and for their overall development. Our employees are active members in the local community, parents, children, siblings, aunts & uncles, students, and volunteers. We appreciate them for everything accomplished at work and at home. It’s one of many reasons Our People Shine! Our teams do more than simply clean homes; we create a healthier environment for your family to enjoy safely. Common cleaning solutions help to remove visible dirt and dust, but they have a dirty secret. Many of these solutions leave behind something that can be just as harmful to your family: Chemicals! That’s right. Many of today’s top cleaning solutions leave behind harsh chemicals that can have negative effects on humans and animals. Read the labels on the bottles; can you even pronounce all of the words? Now think about where these chemical compounds are sprayed or poured in your home and everything (or –one) that comes in contact with them. different cloths & mops in every home and rotating new ones between rooms to ensure no cross contamination. 4-Stage, HEPA filtered vacuums that capture 99.9% of allergens. Our vacuums are recognized by the American Lung Association to improve indoor air quality. no artificial fragrances. These are contaminants, as well. Ready to learn more about how our professional cleaning services can provide a healthier home for you? Give us a call at (703) 754-3635. Maid Brigade is about more than great looking homes and happy customers! Our cleaning service also help families across Fauquier County, VA put time back in their week. Give us a call or complete an Estimate form, and our professional house cleaners can be at your home in no time. No matter whether you spend your weekends strolling through the Virginia Wineries or enjoying that weekend’s events at Great Meadow, we’re ready to do our part! There’s so much to do locally with family and friends that no more of your time should be spent laboring for hours at home. Let our expert maids handle it. We’ll work with you to design a program that allows time to hike Bull Run Mountain. Simply need some “me” time? After all, you deserve it! Relax and treat yourself to a well-earned mani-/pedi- or afternoon in Old Town Warrenton! Whatever your choice, our maids will ensure that you have a cleaner, healthier home to enjoy. Call us or take a few minutes to complete our Free, No Obligation Estimate to get started. We're ready!